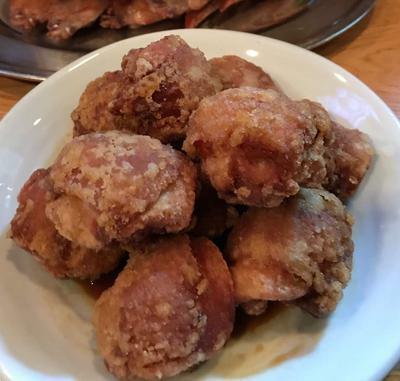 Tebaya (手羽家) is one of the best chicken wing restaurants in Sapporo Japan. Most of their food is mainly fried and very reasonably priced. There are a couple of vegetable dishes, such as cucumber with miso sauce but people come here for the chicken wings. The wings are very simple. Cooked with salt and pepper, no thrills. If you want a variety of flavourings this place is not for you. Expect basic, simple and very very tasty. 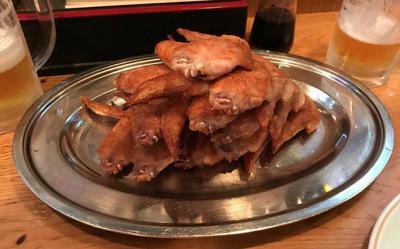 The standard portion size is 18 chicken wings for less than 1000 yen. They are big wings too and it might be a struggle to finish if there are only two of you. A great accompaniment to the beer and wings is the fried chicken (karage). This is a dish of about 10 fried pieces with a drizzle of delicious teriyaki-ish (not sure what it was) sauce at the bottom, for about 800 yen. These dishes along with an all you can drink (nomihodai) plan is more than enough for two hungry men. We struggled to finish everything, but we refused to be beaten, goddammit! This place is always packed and has an izakaya (Japanese bar) atmosphere, so pretty loud, smoky and usually filled with businessmen. It's pretty cool, but definitely not a date spot. Make sure to make a reservation a week in advance because it's very popular. Look for this kanji 手羽家 on the shop front because there is no English signage. There are no English menus but the staff speak a little English, and they will expect you to order chicken wings so don't worry about being misunderstood. Address: West 5, South 1. It's located inside a building on the ground floor so you'll have to do a little exploring. Opening times: Monday - Saturday 17:30 - 23:00 Closed on Sundays.